When Should I Call an Emergency Electrician in Los Angeles? In most cases, it’s obvious you have an electrical problem, and there’s a narrow window to call an emergency electrician. Electrical problems can escalate quickly and lead to more dire situations. You and your family’s health and safety may be in jeopardy, while an electrical malfunction can put your entire home at risk. Electrical fire – Cut the circuit breakers and, when the power is off, use water, a fire extinguisher, or fire blanket to put it out. If the fire is large, leave the building (staying close to the floor) and call 911. Electric shock – Don’t touch the person being shocked or any damaged wires; cut the power if near a breaker or use an insulated object to separate the person and electrical source; then administer first aid and call 911. Exposed wires – Frayed or otherwise damaged wires are an immediate shock and fire hazard. Block the area immediately and stay a safe distance away; also, stay clear of any water in contact with exposed wires. Crackling/sparking switches – Most likely a wiring problem that you can’t see, but an immediate fire hazard; call your emergency electrician right away to determine the scope of the problem and fix it. Smoking outlet – If an outlet or receptacle is emitting smoke, and/or has a burning odor, a hidden wiring problem is likely to escalate quickly; luckily, we offer emergency service 24/7 and can help avoid a fire. Power outage – Find out if your neighbors have power; the power company will have to address widespread outages, but if only your home is affected, call our electrician to find the source of the problem. If you suspect there’s a fire, evacuate and call 911. Circuit breaker trips repeatedly – The circuit may be overloaded if you can’t find an obvious cause, the breaker doesn’t appear broken, and switching it back won’t restore power. In this case, an arc fault may occur. Flickering/dimming lights – May be caused by a damaged fixture, faulty wiring, or overloaded circuit; if the problem persists and stormy weather isn’t to blame, contact our emergency electrician for help. Hot electrical panel – Improperly rated or equipped panels can overload, melt, and cause a fire. If a panel is hot to the touch or you feel heat emanating from it, assume you have an electrical emergency and call for help. If you have aluminum wiring installed in the 1960s and 1970s, it may already have degraded due to its susceptibility to thermal damage. Loosened connections and exposed wires can put you in danger. It should be replaced with industry-standard copper wiring, which is much safer. The same goes if you still have knob and tube wiring, which is more common in homes built in the mid-1930s and earlier. Such a wiring setup cannot handle the load required by modern appliances and doesn’t comply with modern standards. Get it replaced to update your home and restore your safety. 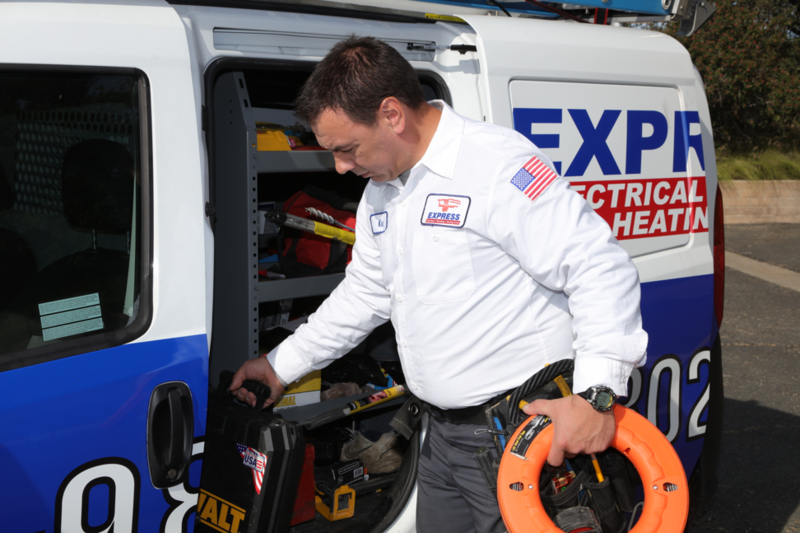 Our emergency electrician is available 24/7 and can be at your home in 60-90 minutes. We service customers throughout Southern California, including Los Angeles as well as Orange County and Riverside County. Committed to keeping your home and family safe, our Los Angeles electrician can be reached at 855-220-1307 or by requesting service online.